The doctors at PASSNJ are currently using the medication "Chantix" for smoking cessation. We have a great deal of success with this product for people attempting to quit smoking. We offer a reduced fee for the initial visit if the purpose of the visit is to discontinue smoking. We provide smoking cessation treatment to all of our patients as part of their treatment at no additional charge. I f you smoke and cannot come in for treatment consider seeing your PCP for Chantix to stop smoking. He or she can advise you on the medication and possible side effects. It's recommended that you begin your CHANTIX treatment a week before you stop smoking completely. This gives CHANTIX a chance to build up in your body. You may smoke during the first week of your CHANTIX treatment, but you should stop smoking completely on Day 8 of your treatment. CHANTIX is proven to work. In studies, 44% of CHANTIX users were quit during weeks 9 to 12 of treatment (compared to 18% on sugar pill). CHANTIX also helped reduce the urge to smoke. 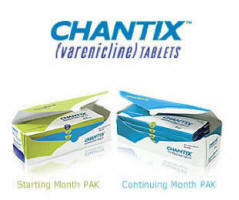 CHANTIX has been proven to be more effective in helping smokers quit than Zyban® (bupropion hydrochloride). The average person in these studies had been a smoker for more than 24 years. The trials involved a mix of men and women who smoked an average of 10 or more cigarettes a day. Zyban is a registered trademark of Glaxo Group Limited.